Join the Octavia Books Science Fiction Book Club for a discussion of Barbara Comyns’ The vet's daughter. 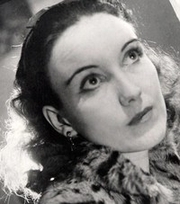 Barbara Comyns was the pen name of Barbara Comyns Carr, née Barbara Irene Veronica Bayley, born 27 December 1907 at the family estate of Bell Court, Bidford-on-Avon, Warwickshire, the fourth among six children (five girls and one boy) of a Birmingham brewer and industrialist. She was educated by governesses and began to write and illustrate stories by age 10. Following the death of her father, she went to London to attend the Heatherley School of Fine Art. In 1931, she married John Pemberton, a painter, with whom she had two children. The couple moved in artistic and literary circles that included Augustus John and Dylan Thomas. After a divorce, she supported herself and her children by various jobs such as trading antiques and classic cars, modeling, breeding dogs, renovating apartments, and working as a cook in a private house. Some of these activities were featured in her 1987 novel, Mr. Fox. In 1945, she remarried to Richard Comyns Carr, who worked in the Foreign Office. Barbara's first published book was the semi-autobiographical novel Sisters by the River (1947), based on her childhood. Her next novel, Our Spoons Came from Woolworths (1950), was based on her first marriage. Others among her 11 novels were Who was Changed and Who was Dead (1955), The Vet’s Daughter (1959), The Skin Chairs (1962), and The Juniper Tree (1985). Out of the Blue into the Red (1960) was a nonfiction book about Spain, where she and Comyns Carr lived for 18 years. The Vet's Daughter was adapted by BBC radio and also became a 1978 musical called The Clapham Wonder. Barbara Comyns is currently considered a "single author." If one or more works are by a distinct, homonymous authors, go ahead and split the author. Barbara Comyns is composed of 5 names. You can examine and separate out names.